At this point, I see the U.S. economy as performing well, Yellen said on Wednesday in testimony before the House Financial Services Committee in Washington. Underutilization of labor has "diminshed significantly," Yellen says. Fed eral Reserve Board Chair Janet Yellen said an improving economy has set the stage for a December interest-rate increase if economic reports continue to assure policy makers that inflation will accelerate over time. “At this point, I see the U.S. economy as performing well,” Yellen said on Wednesday in testimony before the House Financial Services Committee in Washington. “Domestic spending has been growing at a solid pace” and if the data continue to point to growth and firmer prices, a December rate hike would be a “live possibility,” she said in response to a question from Representative Carolyn Maloney, a New York Democrat. Yellen’s testimony drove the yield on two-year U.S. Treasury notes to as high as 0.82 percent. The Standard & Poor’s 500 Index of U.S. stocks was down 0.17 percent at 12:14 p.m. The Federal Open Market Committee in its October statement said it will consider raising interest rates at its “next meeting,” citing “solid” rates of household spending and business investment. 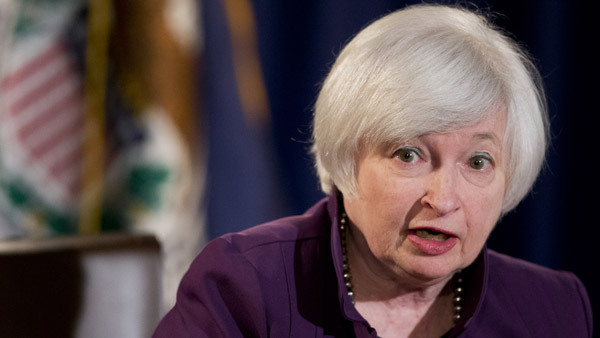 No decision has yet been made on the timing of a rate increase, Yellen cautioned. Yellen appeared before the House Financial Services Committee to testify primarily on the Fed’s supervision and regulation of financial institutions. “I see underutilization of labor resources as having diminished significantly since earlier in the year, although recently we’ve seen some slowdown in the pace of job gains,” Yellen said. “If we were to move, say in December, it would be based on an expectation, which I believe is justified, that — with an improving labor market and transitory factors fading — that inflation will move up to 2 percent,” Yellen said. Michael Gapen, chief U.S. economist at Barclays Capital Inc. in New York, said Yellen’s comments on inflation served to deflect an argument outlined in October by Fed Governor Lael Brainard that the central bank should wait to see movements in inflation before raising rates. Yellen rejected that argument in favor of a “forecast-based decision,” Gapen said. While Gapen said a December hike is now the Fed’s “base case,” Chris Rupkey, chief financial economist at Bank of Tokyo- Mitsubishi UFJ Ltd. in New York, disagreed. Economic growth slowed to a 1.5 percent annualized pace in the third quarter, according to the government’s advance estimate on gross domestic product. However, low gasoline prices and employment, and income gains are projected to sustain spending. In response to a question from Minnesota Republican Tom Emmer, Yellen said she wouldn’t rule out using negative interest rates to help stimulate the economy in the event that another serious downturn occurs before the central bank can lift rates away from zero. –With assistance from Steve Matthews in Atlanta and Jeanna Smialek in Washington.